Exped Outfitter Tarp III. Made of durable fabric and offers versatile protection against the elements. Each corner features an adjustable Dyneema guyline with anchor hook. The guylines are stored in ingenious cord sacks that prevent them from getting tangled up during storage. 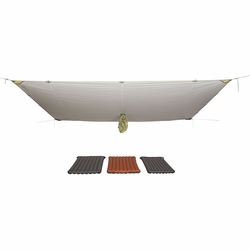 The attached storage bag doubles as central support for a tarp pole, paddle or similar and can not get lost. The side entry of the storage bag makes packing quick and simple.